It is fair to say that Bruce Willis hasn't had a legitimate hit in a while. This is mostly due to the fact some of his recent endeavors haven't been of the highest quality-don't act like you haven't already forgotten 'Cop Out' or 'Surrogates'. 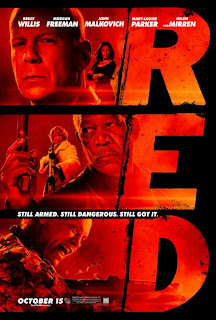 So to see him lead an all star band of veteran pros in 'RED' is both refreshing and thrilling. As a retired CIA agent it is obviously hard for him to adjust to the calm suburban life where he finds a sliver of happiness in calling Sarah (Mary-Louise Parker) a phone operator he rips up his pension checks in order to talk to. When a mysterious someone wants him dead the action begins and Willis must put his old gang back together to figure everything out. Though the story is rather familiar in the ways of government conspiracies and action heroes uncovering it that's not to say this isn't a fun ride because it is honestly one of the funnest films I've seen this year. Most of this is due to the genius of casting golden actors in roles that aren't as prestigious as they may have been advertised to be. Helen Mirren isn't introduced until around the half way point but even so she provides some of the more memorable scenes in the film. Watching Helen Mirren firing a machine gun in a dress and combat boots is one of the best and funniest things I've seen in a while. This leads to another fantastic thing the film is able to do. Balancing the comedy and action better than most. As the LSD-induced Marvin, John Malkovich nearly steals every scene he is in. He is funny without being ridiculous, in fact he is very serious, serious as can be. Constantly worrying the government is watching and always on the watch. A scene involving him and a pink pig is one that will most likely be discussed as the high point of the film. What is great to watch though is the way Willis, Malkovich and Morgan Freeman work together. Freeman also has a smaller sized role than you may have thought, but it is impossible not to like the man and he adds one of the most touching scenes to the film. To see all of these great actors working together and to see them really getting into the material certainly elevates the film to a level it certainly wouldn't have reached otherwise. Seeing as 'RED' was written by the guys who wrote last years pretty plain Kate Beckinsale flop 'Whiteout' this could have been a complete disaster, but the acting talent along with director Robert Schwentke's ability to capture a nice action scene on film not only makes 'RED' a funny and exciting movie to watch in a packed theater but it is one you genuinely enjoy, one you could watch repeat viewings of and wouldn't mind. It is also a film that should give Willis a well deserved hit. He anchors the film well and his relationship with Sarah is a high point of a movie full of good moments. It is worth mentioning Karl Urban as well, who hot off his star making role in last summers 'Star Trek' plays a man of many layers here. HE is initially used as the clear antagonist, but by the end he is turned around and given actual human qualities. Lastly, I have to talk about the audience for the film-it is one that could turn out to be a marketing wonder. I attended an early show yesterday and was surprised at the number of older people in attendance. The pedigree of the cast will attract the elders during the day and the action element I suspect will attract younger crowds at the later shows. Its a win-win situation and I hope it works. I loved the film.